Heartland Hospice serving Tide Water teamed up with the local community to help a hospice patient and her family. Watch this heart-warming story about how a community came together to help a Heartland Hospice patient and her family in their time of need. To learn more, click here. “I want to thank you and your team at Heartland Hospice for the excellent care you provide to our patients and their families. Specifically, I wanted to share the experience I had with one of our families. Both the patient and his wife were hesitant to sign-up for hospice because of horror stories they were told by friends and family. The other morning the wife called me with a completely different perspective of hospice and the care they provide. She went on to comment about how the level of care her husband received from Heartland was above and beyond what they expected or ever thought they would receive and couldn’t have been happier to have Heartland in their home." "I make many referrals a week but the one referral I never question or worry about is a referral to Heartland. We will continue to use them as our primary hospice because of experiences like this. I can’t tell you how proud and happy I was to receive this phone call and know that I have an amazing care team. This family will always remember Heartland." 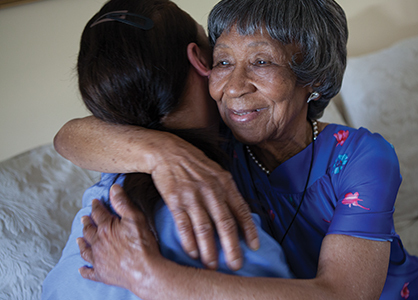 Tina McDaniel, RN Case Manager for Heartland Hospice serving Augusta had an experience that reminded her how plans can change and the privilege of being there with her patients as they near their end-of-life journey. When Tina arrived the patient was in pain, struggling to breath and very scared. She gave him his medicine and made him comfortable in his bed. “I told him that I would be with him as long as he needed me. I sat at his bedside at eye level and told him, just look at me,” explained Tina. “I firmly believe we are put exactly where we are meant to be and I was supposed to be there with him. Death is as much a part of life as being born. Someone transitioning deserves the same love and compassion as a new baby entering the world. This patient shared his last hours of life with me. That is truly the highest honor and privilege I could ever hope for,” added Tina.